The game is a 2D physics world with vertical gravity, wagers (coins) are dropped/thrown in at the top and collide with each other and obstacles until they settle into a hole at the bottom that determines their result. There is no 'house edge' because players are wagering against each other, not the house. The game generates revenue as a service fee of 5% on all the coins that are redistributed via winnings. The physics are governed by open source client side software that creates an environment that is arguably more transparent and less hostile than traditional purely price based trading (and a lot more fun!). In this way Crypto Collider is analogous to 'the-trading-game' / regular trading but with the laws of physics in place of order books and price discovery. Trading profitability is determined by accurately predicting (and prehaps influencing) price changes within the market environment while "Colliding" profitability is determined by accurately predicting and influencing the simulated physical results within the game environment. Client Based Confirmation of Gaming Results! Crypto-Collider uses an open source client-side physics engine to confirm game results and visualises the resulting 'GameChain' into the exciting new game and type of trading / hedging service. 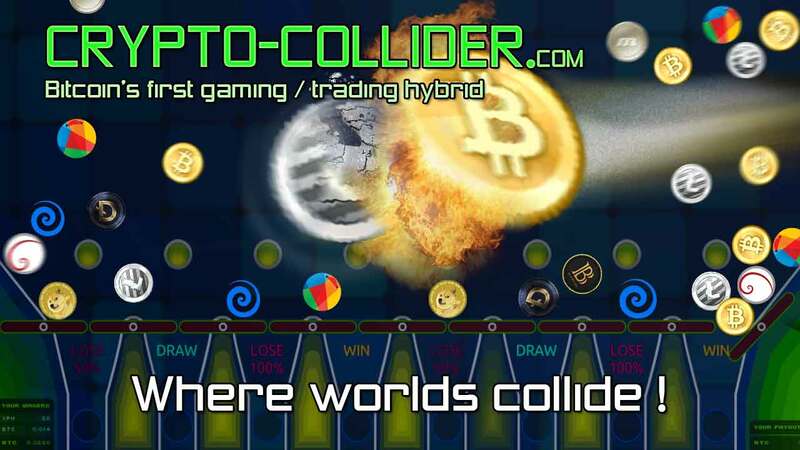 In the same way that Bitcoin brings new opportunities for fairness, transparency and all the generous benefits decentralisation to the banking and finance industry; Crypto-Collider, through the GameChain, seeks to bring this same level of genuine fundamental change to the gaming, trading and gambling industries. The impact of client-side confirmations and complete transparency of game activity, over time and once prove successful with this first example, can not be underestimated without risking appearing as foolish as those who originally underestimated Bitcoin and the internet itself. Power to and from the people is what its all about and makes it work; empowered and educated is the future for all Crypto-Currency and Crypto Collider supporters. Off-load or accumulate coins without affecting their price! That's right because the game is based on the laws of physics instead of market prices, it provides a way to move into or out of coins without being exposed to order book slippage or affecting their price! It's a common and logical strategy for players to wager larger amounts of coins while their price is in decline as a complete or partial alternative to trading out of them (a.k.a dumping). Using this strategy players are assured to eventually off-load (i.e. lose 100%) of the coin they no longer want while likely accumulating winnings in a variety of other coins based on the current value of the depreciating coin without further encouraging that devaluation. The winning players receiving these 'dumping' wagers as winnings may then quickly trade those winnings anyway but as the game strives to support only legitimate long term investments that should be expected to recover, the percentage of players using the game as a hedging service will likely hold all winnings and thus increasing the price stabilizing influence of the the collider system on the coins that it supports. Top 10 Players Receive 18% of All Game Fees! Seamlessly integrated within the Collider Coin system these payouts are provided by the internal allocation of Collider Coin to ten placeholder accounts for each of the top ten spots. Because of this the redistribution of revenue back into the system and its players is easily adjusted over time in a transparent and accountable process (i.e. top ten pay % may change slowly over time but revenue distribution will always be fully transparent and verifiable). Your points and position on the ladder can by viewed via the 'Leader Board' panel once logged in. The ladder data is updated with each new game confirmed. Each game confirmation also awards one point to the confirming user and this is why confirming (watching) games has value and reward in it. Bitcoin's great, but what can you do with it besides buy and sell? Its a common experience for a person to discover Bitcoin and the greater decentralised idealogy and become inspired by its technology and potential for positive change. Motivated to be involved in the new economy, they then come to own their very own Bitcoin and of course the question presents itself... what can I do with it now? Everyday this changes, but as completely new and innovative global monetary system, there's not much more you can do with crypto, than just buy or sell... So many people who come into crypto inspired by its humanitarian potential then find themselves in a hostile trading environment that is modeled on existing markets and dominated and manipulated by miners and those who have spent decades mastering their trading skills in otherwise unrelated but similarly hostile and volatile unregulated trading markets. Combined with the accelerated pace of the industry evolution, the task of successfully navigating the Bitcoin and Alt-Coin trading environment can only be described as incredibly difficult and high risk. Crypto Collider by the way that it works and the coins it chooses to support, aims to serve as far less risky and more enjoyable alternative to trading for those who are interested in crypto trading/hedging but are without the time, inclination, skills or experience to avoid its obvious and significant dangers. Its still possible to win even if most of your wagers are lost! This scenario is actually a common and intentional side-effect of the Crypto Collider system as a players profitability and strategy is not only determined by their wagers value and trajectory but also its coin type and game selection - i.e. choose the right coins to wager in the right games and it almost won't matter what percentage of losses you have as long as its not all of them. to even out the high variability of outcomes within individual games. This is in contrast to the player who wants to use the Collider system as an alternative to dumping/trading out of their coins who needs to do so in a much more immediate strategy - their results will be much less predictable although much more immediate (which could be preferable if the coin in question experiences a steep decline in the time it would take to make more wagers of smaller units over more games). But it's also a Game, its also really FUN! Jump right into a Collider game with a giant smashing take no prisoners biggest balls bonus and watch all the punny competitors whimper and succumb to your impressive ball power! But the question remains... are you actually going to? Do you really have the biggest balls? + Crypto Collider benefits from all the existing security features of the leading exchanges that it integreates for coin storage and blockchain transversal. + All game data is transparent and withdrawals always for 100% of your balance in that coin; your coins are safe and really here! + Account details are secured via a completely custom and unique multi-server multi-signature security and audit system. + Crypto Collider continually monitors all user account balances with regular 30 second audits and halts immediately should any problems be found. + All user communication with the Cypto Collider server is secured via SSL AND a custom user key encryption system, you can not be easily impersonated even in the case of a full SSL breach. + The fast and reliable delivery of data is secured from Denial-Of-Service attacks via a global content delivery system that includes multiple high bandwidth servers in every continent. - Win = The wager is returned to the user and additionally its proportion of all lost wagers are distributed to this user relative to the wagers value in BTC to all winning wagers in BTC (ie. if you had 50% of the total btc value that fell into winning hold, you would get 50% of the wagers lost into the losing holes). + Each Wager is a volume of a single coin type, represented by that coin's logo. There is a minimum wager value for each coin type, there is no maximum. + Players use the mouse (or finger in tablet version) to determine the coin's/wager's entry speed, position and spin. + Each Wager's Weight or Mass inside the 2D physics simulation is proportionate to its estimated value at that time. This is very important as it means larger wagers will be 'heavier', less influenced by smaller / lighter wagers and more predictable to their original entry trajectory. + Wagers enter the game in sequence every 10 frames in the same order they where received by the server. Each frame is .04 of a second within the physics simulation. + To prevent a game ever running for too much time; on frame 2000 the 'flippers' are spun and gravity doubled, and then from frame 3000 onwards gravity increases again and all remaining coins have friction set to zero. + Crypto-Collider is an experimental service that is offered as is with no pre-condition or liability to damages as a result of its use. Trading revenues and Crypto-Collider gaming revenues are likely to be complementary while also never directly competing (ie. both aren't likely to peak in volume simultaneously) and this provides an excellent hedging opportunity between these two different types of service/user activity. This is demonstrated by player activity so far is a direct counter-balancing relationship where traders who traded into coins they no longer want are more likely to play them into Crypto-Collider and coins won in Crypto-Collider that those players don't want are obviously sold and go back into trading. Crypto-Collider is designed as an alternative to trading that can attach to and expand the established exchange model with positive side-effects for any exchange it integrates with, especially in the case that integration is exclusive. The game can operate tightly integrated with a single superior exchange, independently of all exchanges or any combination in-between. This is an incredibly powerful and unique advantage that potentially hedges Crypto-Collider across the entire crypto industry, or as much or as little of it as required to achieve the balanced growth and targets outlined below. The average total Crypto-Collider game fee percentage is variable based on player behaviour, game features and design so far demonstrated in the range from ~1% to ~1.8%. If you deposit from a source that charges a withdrawal fee, make sure to add the fee before withdrawing. I.E. If your user ID is 117 and you are depositing 30.54 coins. The total deposit must look like 30.54000117. If the exchange charges a fee of 0.00200000 and the exchange charges on top of the total then your withdrawal will look total will be 30.53800117 making your ID appear to the system as ID 800117. So simply put, just make sure the total is exactly the last 6 decimals to match your player ID. Updates on Targets, Dates, Mobile version, Challenges and Phases coming soon! Account creation is free. The Android is app is free as well. You can also browse as guest without making an account if you would like to have a look around. Right on HowDoge At first glance it appears as just a simple gambling game, Once you dive a little deeper you can really see how different it is! Thanks for checking it out! ''account creation is free'' Ye watch out..
wow account creation is free.